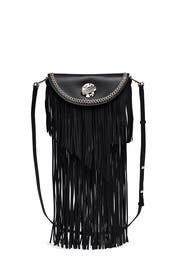 Swishy fringe offers a whole lot of fun on this trendy case by 3.1 Phillip Lim. 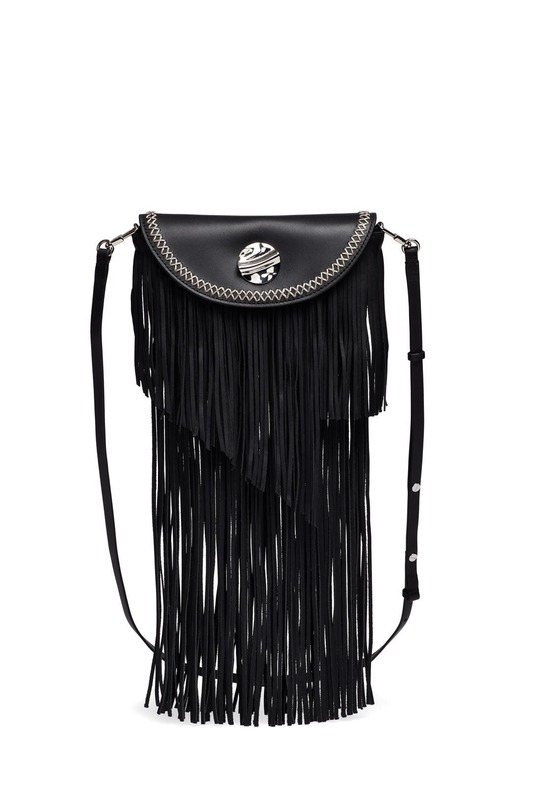 Black leather mini case belt bag with leather fringe accents. 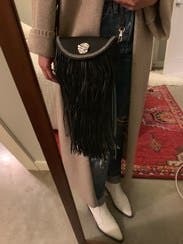 Can be worn as a crossbody or belt bag. Snap front closure and internal zipper compartment. 4.25"H x 7"L x1"D.
PROS: Very cool and casual, wore it out to a bar then club, then to casual brunch the next day. Comes with the shoulder strap and a belt strap which I didn't know about, usually love a belt bag so good to know for the future. It has a nice zipper pocket inside which is key. CONS: This was WAY smaller than I thought it would be... and I didn't take a picture of it my bad. Like my iphone 7 didn't fit. It was barely big enough for keys and lipstick. The other issue is the button is really hard to close, an annoying detail on such an expensive bag. Didn't love the look as a belt bag but cool that it's an option. Wore this for an evening out with a fun sweater and it complimented the outfit perfectly. Didn't even realize it comes with a separate strap to make it into a belt bag! 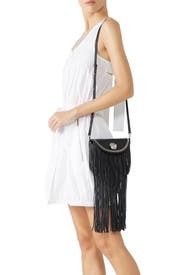 It's definitely a lot as a belt bag but will be perfect for festival season. Great rental. I love this purse & don't want to give it back! I was pleased to see you can also wear it as a fanny pack - only draw back there is the studs are hard to get in & out when you're trying to adjust it around your waist. I ended up carrying as a purse & I love what it does for my outfits! !